difficult to adjust the alignment. clamped the scrap to the moveable jaw of my vise. That gave me plenty of room to work. 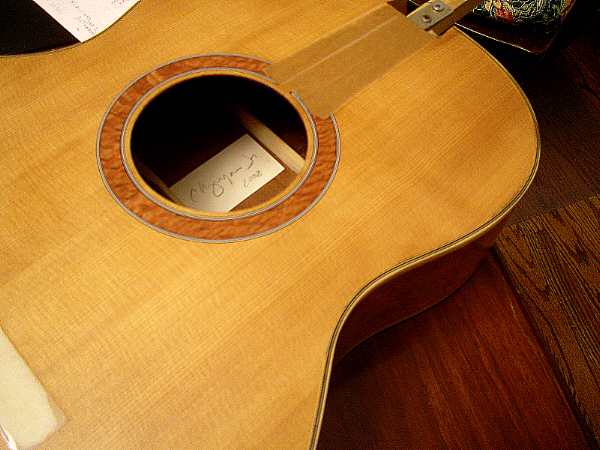 so it will cover the filing/sanding marks left from fitting the neck to the body. 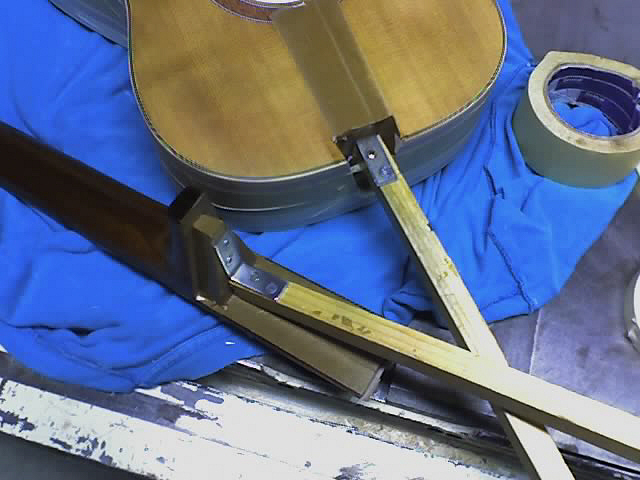 below the fret tang at the point I put the brad. hammering. And you got your length of surplus fretwire. ('bent rod') has a wooden spline that presses on it so rattle is elimiated by default. which meant I would have had to file pretty aggressively to get them leveled. So I decided to tak the fretboard back off and try again. minutes. Repeat until you can get a sharp spatula in the joint and work the board off. Slowly, take your time. just that purpose, scooped and padded with cork. 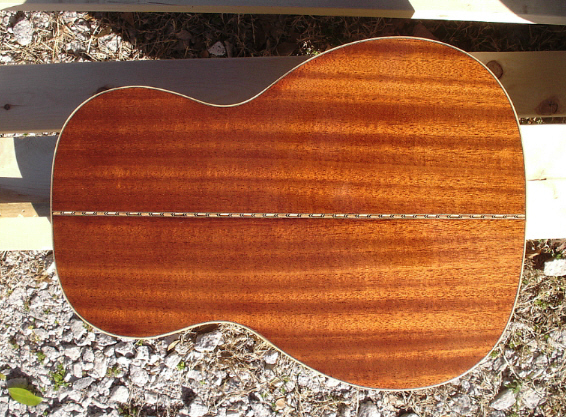 of little dabs of caulk at the ends of the truss rod, and putting to use the caul I had made just that morning. fretboard it was too long and I ended up with dents in the heel and the back of the headstock, but it's a nice fit now. and after that finishing finishing finishing finishing. when I tried -- wait for it -- tighening it just a bit. Ta Da! No more rattle. Duh. bevel the bottom edges of the bridge where it overhangs the thickness of the lacquer). acoustic I filled the mahogany with a dark brown filler. It looked ok on the LP but for some reason on Acoustic No. though and should have some new pictures before long. sides... They are in good shape and don't really need another coat, so I'm leaving well enough alone. I took this photo with my phone, so it's not the clearest. that's pretty hefty tape. So I won't mind taking some off. tell ya, it sounds pretty good to me. on lots of coats, campers. This is the first dry and reasonable calm weekend in a month at least. Got two good coats sprayed today. One or two more tomorrow and I'll try to finish sand again. spray equipment is) and start sanding/polishing again. I'm really going to try not to sand through again. forgot to take a photo of the bridge, which I also sprayed... c'est la vie. saddle, and set the thing up for playing.